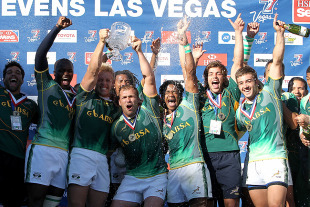 South Africa won their first IRB Sevens World Series event in nearly two years on Sunday as they eliminated England on the way to a 24-14 victory over Fiji in the Las Vegas final. Cecil Afrika, Chris Dry and Branco du Preez scored as the Springboks led 19-0 after five minutes of the decider but Watisoni Votu hit back for Fiji before the break and Matieli Nacagilevu's try made it 19-14 in the second half. But Bernardo Botha crossed to make sure of a surprising Cup victory and 24 precious points in the IRB standings. South Africa had earlier defeated England 17-10 in their semi-final, while Fiji turfed out New Zealand 26-7 in another surprising result. Defending champions Samoa took out the second-tier Plate final after defeating Kenya 26-15. Kenya had earlier knocked out Australia in yet another upset, and their successful tournament sees them move up to ninth in the overall standings. Scotland won the third-tier Bowl final and United States gave the home fans something to cheer about with victory in the Shield decider. After their semi-final exits, New Zealand and England remain locked up at the top of the competition standings at the halfway mark. Next up is the famous Hong Kong Sevens starting on March 25.